Supreme Court nominee Samuel Alito recommended against appealing to the high court a ruling that revived a Black Panther Party lawsuit against the government. 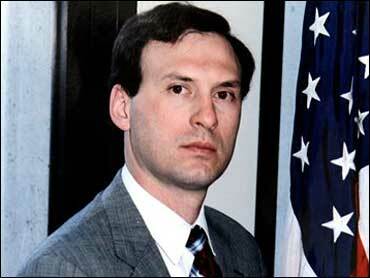 Alito, working in the Justice Department at the time, argued that the department could win the case in a lower court. "None of the legal issues presented by this case seems to warrant Supreme Court review," Alito wrote on Nov. 19, 1981, while he was working for the solicitor general's office. The memo was among another batch of Alito papers released Wednesday by the National Archives. The Black Panthers' lawsuit accused government officials of conspiring against the militant group and its members for years. A federal judge had thrown out the lawsuit, but the U.S. Court of Appeals for the District of Columbia reversed that decision. The appeals court ordered the judge to reconsider the case. Alito noted that nothing in the trial court was "decided against the government with finality." And "even if the Supreme Court were to agree with our arguments, it would not follow that dismissal of the complaint would be the appropriate sanction," he wrote. The Supreme Court thought otherwise. The Justice Department went on to appeal the case to the high court, which ordered the Black Panther lawsuit thrown out. Alito did note that he could see a reason to take the case to the Supreme Court, considering its high-profile nature. "This is not an ordinary lawsuit, and the issues may consequently take on added significance," Alito said. "While I am convinced that the individual legal issues do not warrant the filing of a petition action, I recognize that a decision to the contrary has something to recommend it." The Black Panther Party had sued several federal officials, saying that since 1968 the directors of the CIA and the FBI, attorneys general, Treasury secretaries, postmasters general, IRS commissioners and other government officials had conspired to destroy the Black Panthers. One of those sued was then-CIA director and soon-to-be-president George H.W. Bush, father of the current president. Alito worked for the solicitor general's office in 1981-85, and also as deputy assistant U.S. attorney general from 1985-87 before becoming a federal prosecutor and judge. President Bush picked him for the Supreme Court in October as the replacement for retiring Associate Justice Sandra Day O'Connor. Many of the documents released by the National Archives on Wednesday simply indicate that Alito was copied in on internal Justice Department memos, or are photocopies of decisions that were made by federal judges while Alito was working for the department during the Reagan administration. The Archives said it found the documents in the files of former Justice Department officials while processing Freedom of Information Act requests. Alito's confirmation hearing in the Senate Judiciary Committee begins Jan. 9. Republican leaders are pushing for a Jan. 20 confirmation vote in the full Senate.